Exposure 16 minutes (8 X 2 minutes) four frames were unguided and four were guided. Processing Calibration, stacking and DDP Images Plus No flats were used in the calibration. Slight noise reduction applied in Paint Shop Pro . The star colour was enhanced slightly. There was no sharpening or star reduction applied. Thought I'd try the APO for imaging and was pleasantly surprised at the quality. The conditions were not good with a full Moon and lots of thin cirrus cloud and urban light pollution, but what can you do? 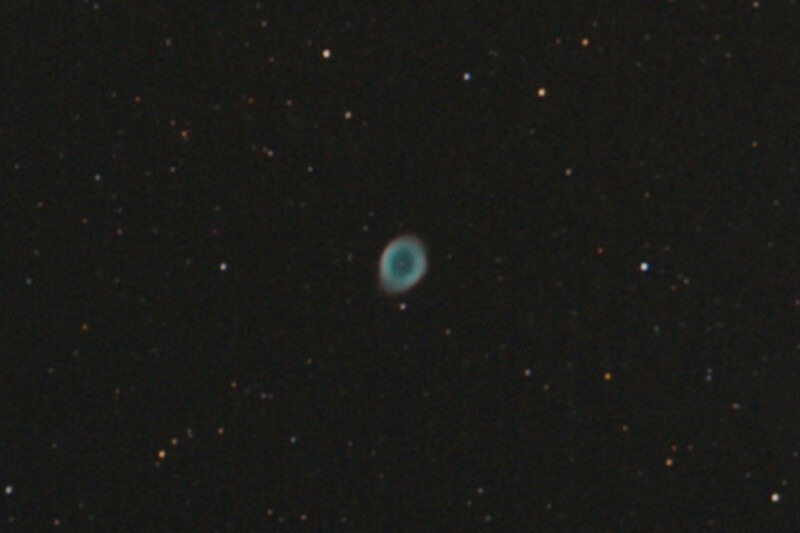 M57 was chosen because it was bright and I figured it would show through the cloud. Below is a 100 percent crop of the nebula showing the image quality produced by the small SkyWatcher APO. I purchased the scope for use as a guide scope on my regular imaging setup as the price was right for a 100 mm refractor.